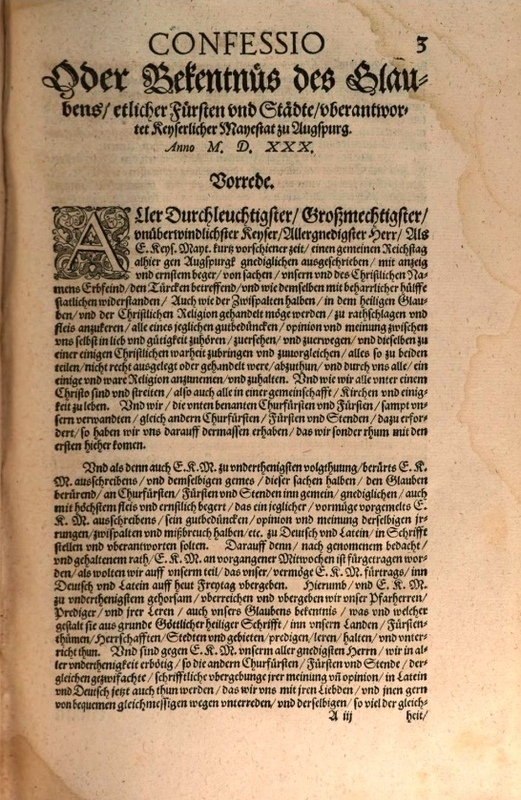 This begins a series of fresh translations of the German articles of the original, unaltered Augsburg Confession. While both the German and the Latin versions are official, since both were submitted to the Holy Roman Emperor, the German can be considered more official, since that version was the one publicly read in the meeting of the imperial diet on June 25, 1530. For more on the historical background and continued contemporary significance of the Augsburg Confession, click here. My source text was Die Bekenntnisschriften der evangelisch-lutherischen Kirche, ed. Hans Lietzmann, Heinrich Bornkamm, et al., 2nd ed. (Göttingen: Vandenhoeck & Ruprecht, 1955), pp. 31ff. Tappert’s translation was consulted as an advisor, but if anyone suspects plagiarism, I freely invite the reader to compare his edition with mine. It was partially due to the occasionally glaring weaknesses of his edition that I was encouraged to continue working through the German on my own once I had begun. The Kolb-Wengert translation was not consulted, since I neither own it nor have ready access to it, and any potential similarities are therefore purely coincidental. The Reader’s Edition is wonderful for the supplementary information and artwork, but cannot be regarded as an honest translation, since the editors simply took the already inadequate and outdated English translation of the old Concordia Triglotta (available online here) and rendered it in updated English without any serious consulting of the original editions (akin to modernizing the original King James Version of the Bible without consulting the original Hebrew and Greek texts). I pray this series proves a welcome addition to the readers of this website. Very few translations could be better qualified as “Translations for confessional Lutherans” (rf. website tag line) than the official confessions of the Evangelical Lutheran Church. I hereby render thanks to my congregation for asking me to study this biblical doctrine with them, and present this series to the glory of the triune God and the edification of the readers. In the first place, we harmoniously teach and hold, in accordance with the decree of the Council of Nicaea, that there is a single divine Essence, which is called God and truly is God, and that there are nevertheless three persons in that single divine Essence, equally powerful and equally eternal, God the Father, God the Son, God the Holy Spirit. All three are one divine Essence, eternal, without parts, without limit, of immeasurable power, wisdom, and goodness, one Creator and Preserver of all things visible and invisible. And by the word person we do not mean a part, nor a characteristic in another, but that which subsists of itself,1 just as the Fathers have used the word in this matter. Therefore we condemn all heresies that are contrary to this article,2 such as the Manichaeans,3 who established two gods, a bad one and a good one, likewise the Valentinians,4 Arians,5 Eunomians,6 Mohammedans,7 and all like them. We also condemn the Samosatenes, both old and new,8 who establish just one person and talk and reason sophistically and deceptively about the Word and the Holy Spirit, saying that they do not have to be distinct persons, but that the Word denotes a spoken word or sound, and that the Holy Spirit is a created movement in created things. 1 In other words, the three persons in the Trinity are not parasites, as e.g. whale lice or whale barnacles, whose continued existence is entirely dependent upon the life of their host. 2 Sadly, heresies contrary to this doctrine that are worse than any of those listed in this article are today not only tolerated under the visible umbrella of Christianity, but even given the name Lutheran. 3 Manichaeism was a religion founded by Mani (c. 216-c. 274 AD), including Gnostic, Zoroastrian, and Christian elements. Mani held that the kingdom of light and kingdom of darkness were in conflict from eternity. Manichaeism spread over the Roman Empire and was a menace to the Church. Augustine of Hippo was Manichaean in his youth. 4 Valentinianism was a heretical sect of Gnosticism led by Valentinus (2nd century AD). It mingled Jewish, Christian, and Greek philosophical ideas into a new religious system. Valentinus held that there was a great First Cause (somewhat equivalent to God the Father) that produced the Mind or Only-Begotten (somewhat equivalent to God the Son), who became the principle of all subsequent emanations. He also taught a feminine element in the First Cause, known as Silence, and a feminine element in the Mind, known as Truth. These formed a productive quaternity which became the origin of all things. 5 Arians were followers of Arius (d. c. 336 AD), a priest in a suburb of Alexandria, Egypt. He taught that Jesus was divine but not equal to God the Father. “[The Son] has nothing proper to God in his essential property, for neither is he equal nor yet of one being with him. … The Father is essentially foreign to the Son because he exists unbegun. Understand then that the Unity was, but the Duality was not, before he existed” (Thalia). The Council of Nicaea (325) refuted and rejected the heresy of Arius and his followers in the famous Nicene Creed, but the aftermath of the controversy troubled Christendom for almost two centuries. 6 Eunomians were a branch of Arians who followed Eunomius (c. 335-c. 394 AD), the “ugly,” “stammering,” “capable, keen, [and] undaunted” bishop of Cyzicum. “There is one God, uncreated and without beginning, who has nothing existing before him… This one simple and eternal Being is God, the Creator and Ordainer of all things. For God created, begot, and made the Son only, by his direct operation and power, before all things, and every other creature; not producing, however, any being like himself, or imparting any of his own proper substance to his Son.” He was refuted by the Cappadocian Fathers – Basil the Great, Gregory of Nyssa, and Gregory Nazianzus. 7 Another name for Muslims, followers of Muhammad (c. 570–632 AD). The Muslim Shahada or creed is: “There is no god but Allah, and Muhammad is the prophet of Allah.” The Qur’an 4:171 reads: “O people of the Book, do not be fanatical in your faith, and say nothing but the truth about God. The Messiah who is Jesus, son of Mary, was only an apostle of God, and a command of His which He sent to Mary, as a mercy from Him. So believe in God and His apostles, and do not call Him ‘Trinity’ [other translations read: do not say, ‘Three’]. Abstain from this for your own good; for God is only one God, and far from His glory is it to beget a son” (Ahmed Ali translation). Elsewhere the Qur’an calls the very idea of God begetting a son “a grievous thing” (19:88-89). 8 The Samosatenes were followers of Paul of Samosata (3rd century AD), the bishop of Syrian Antioch from 260-268. His teaching has been called “dynamic monarchianism,” which holds that God is one being, above all else, indivisible, and of one nature. It reconciles the “problem” of the Trinity (or at least Jesus) by holding that the Son was not co-eternal with the Father, and that Jesus Christ was essentially granted divinity (adopted) for the plans of God and for his own perfect life and works. By “new Samosatenes,” Melanchthon is referring to the anti-trinitarian spiritualists of his day, especially Johannes Campanus, who had been appointed lecturer on theology at the University of Wittenberg in 1528. However, he soon came to open opposition with Luther for his Arian opinions and left Electoral Saxony for the Duchy of Jülich. He rejected the divinity of Holy Spirit and taught that the Son of God is of the same substance with the Father, but not coeternal with him. Campanus reportedly died between 1575 and 1580, out of his mind. We may consider the Jehovah’s Witnesses “new Samosatenes” of our own day.